David L. Clough is Professor of Theological Ethics at the University of Chester and has just finished a term as President of the Society for the Study of Christian Ethics. He co-wrote Faith and Force: A Christian Debate about War (2007), debating just war and pacifism in a 21st century context, and has recently completed the landmark two-volume monograph On Animals (2012, 2018), on the place of animals in Christian theology and ethics. 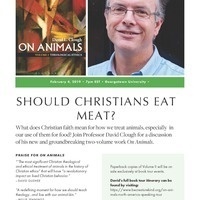 He is the founder of CreatureKind (http://becreaturekind.org), a project aiming to engage Christians with farmed animal welfare, and Principal Investigator for a three-year UK Research Council funded project on the Christian Ethics of Farmed Animal Welfare in partnership with major UK churches and Compassion in World Farming. He is a Methodist lay preacher and has represented the Methodist Church on national ecumenical working groups on the ethics of warfare and climate change.